There are a lot of different ideas floating around out there when it comes to online roulette strategy, and the Internet has made them even more prevalent. There are two main classes of roulette strategies: physical and financial. The physical strategies in online roulette have you track past spins so you can try to identify patterns. These may very well work if a wheel has some small imperfections (not being level or symmetrical), but they simply do not apply to a digital wheel in an online casino. These use Random Number Generators to determine the outcome of each spin, and they actually are perfectly random. Wondering what separates the roulette players from the roulette winners? It's all about strategy. When you know how to place the right combination of bets, and when to raise and lower your bets, you can maximise your profit potential. But there's more than one strategy. Read everything you need to know, right here. Click the image to view a larger version or click below to download the roulette odds chart to use anytime free of charge! 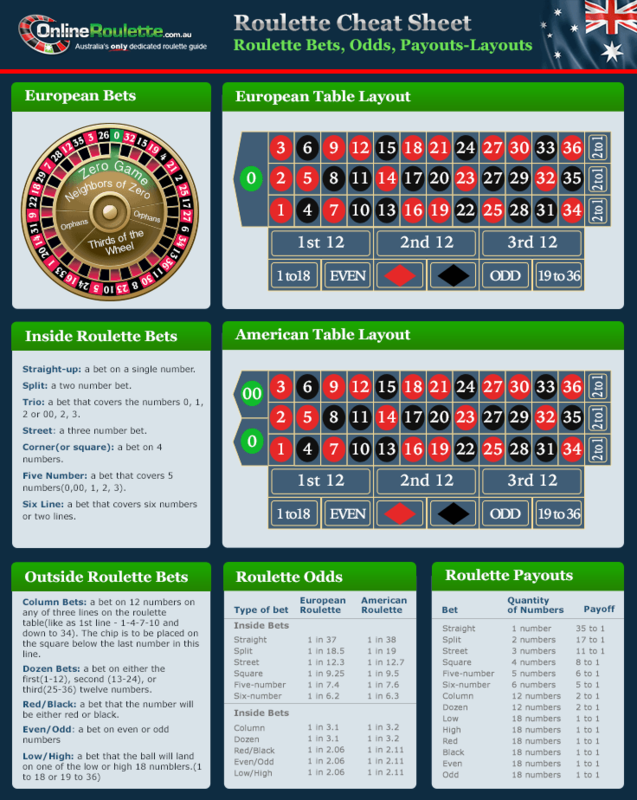 The Andruchi system is one of the most common and widely-used online roulette systems on the net. This online roulette strategy tries to take advantage of the fact that, in the short term, some numbers come up more than others. The supporters say that over the course of 36 fair spins, you tend to only see 24 of the numbers. The other 12 don't come up, even though they had the opportunity to do so. They say this is related to the complicated field of Chaos Theory and that, if you track spins, you can see the patterns of which numbers will appear in the coming spins. When you see one number, they would have you put more money on that number in the next several spins to take advantage of what they believe to be an imperfection in the game, and random systems in general. Another way of thinking about online roulette strategies is that you could always bet on the same kind of wager, but that you only change the size of your bets. The most obvious way of doing this is doubling your bet after every loss (the Martingale System) and returning to a small starting bet after each win. With a very large bankroll and a larger than normal allowed betting range, this could theoretically be possible. Most online casinos, though, have table limits that can put an end to this. You could also try to bet more during "hot streaks" than during "cold streaks". This is a popular online roulette strategy with one flaw: it is impossible to know if you are "in" a streak or on your way out of one. Should I Use Online Roulette Systems? Regardless of what the numbers say, online roulette strategies still might make the game more interesting because they let you put lots of money out from time to time, but that doesn't mean that they work. Mathematics will simply always favour the house in the long run. Use these tools to keep things as interesting as possible; just don't expect them to make you a guaranteed winner by any means. You'll need luck to accomplish that. If you want to give any online roulette strategy a try, though, you can always play for free at one of the internet's top online casinos: the ones with great bonuses and exciting software - the ones that you can trust completely. If you're wondering where you can find an online casino like this, then look no further. We have already sifted through the most popular casinos on the internet to find the absolute cream of the crop for Australian players. Give our detailed reviews a read and then sign up with the one that best suits your needs.